Today's artificial diamonds can look almost exactly like the real thing. Whether you're looking for a modest ring that will fool everyone or a glitzy rock that will turn heads, there are tons of options out there. Click the "Buy Now" icon on image of any of the following rings for purchasing information. When you're buying a fake diamond, your budget doesn't limit the size of the stone. To really make a statement, choose a large gem like this 2.5 carat solitaire. 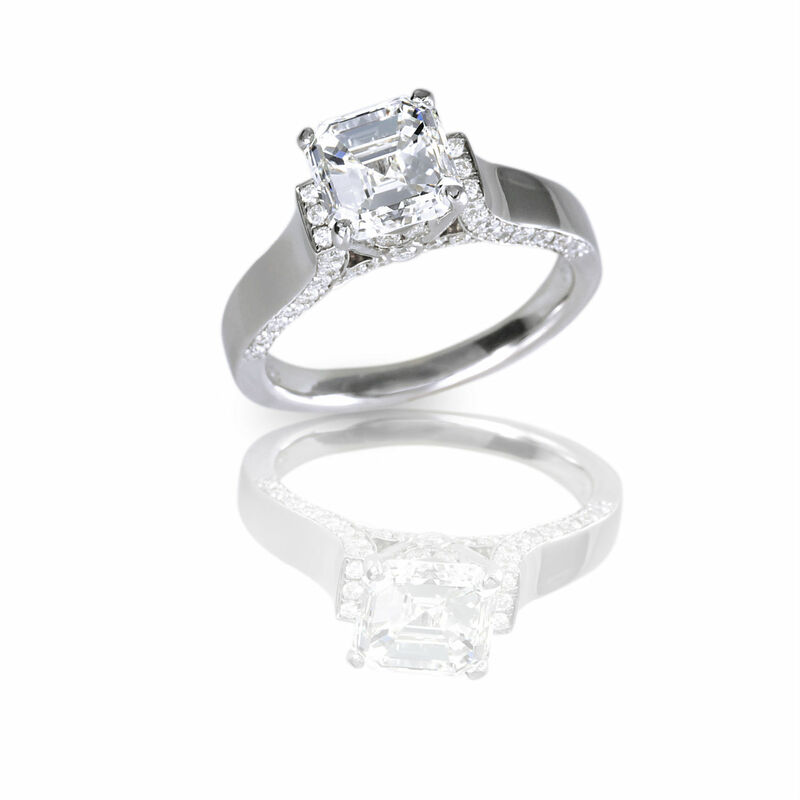 It features a princess-cut cubic zirconia prong set on a simple rhodium-plated sterling silver band. It comes in sizes five through nine and makes quite a statement for about $45. A three-stone design is a classic choice, and this beautiful example could pass for a genuine diamond ring. It features 2.3 carats of round-cut cubic zirconia gems prong set side-by-side on a sterling silver band. Available in sizes five through nine, it retails for about $25. Because it features diamonds all the way around the band, an eternity ring can be an expensive choice. However, when it's crafted in cubic zirconia, it's within the range of anyone's budget. This beautiful band features 5.13 carats of round cubic zirconia gems set in your choice of platinum-plated or yellow gold-plated sterling silver. It comes in sizes six through eight and retails for about $24. Because you aren't investing as much money in your ring, you can experiment with lovely novelty designs like this delicate butterfly ring. Crafted in sterling silver, this sweet ring features .925 carats of round cubic zirconia gems to set in a butterfly-shaped halo that surrounds three-dimensional butterfly wings. It comes in sizes seven or eight and retails for about $24. There's nothing to say that fake diamonds don't deserve fine craftsmanship, as shown in this Myia Passiella simulated canary yellow diamond ring. This stunning design showcases a pale yellow cushion-cut Swarovski Zirconia prong set in sterling silver. More round brilliant Swarovski Zirconia gems decorate the prongs and band. This gorgeous ring comes in sizes six through eight and retails for about $140. Filigree gives a ring a delicate, lacy appearance, and it's also a great way to highlight tasteful fake diamonds. In this 10k yellow gold band, a scrolling leaf design draws the eye while 0.45 carats of cubic zirconia gems add subtle sparkle to the leaves. Available in quarter sizes from five through nine, this ring retails for about $125. A cocktail ring is designed to make an impact on the viewer, and simulated diamonds are an excellent, affordable way to attract attention. In this over-the-top, two-toned design, a starburst of 2.31 carats of cubic zirconia sits atop a band of 10k white and yellow gold. It comes in quarter sizes five through 11 and retails for about $260. One simulated diamond ring is lovely, but three are even better. This triple stacking ring, available in gold-plated or rhodium-plated sterling silver, features 84 prong-set round cubic zirconia gems. It comes in sizes five through nine and retails for about $40 to $50, depending on the size. Women aren't the only ones who can enjoy the beauty and affordability of fake diamond rings. There are lots of attractive options for men too, such as this sterling silver band. It features seven, princess-cut cubic zirconia gems and comes in sizes 8 through 14 It retails for about $40. If you're looking for a budget-friendly wedding ring that doesn't skimp on the sparkle, fake diamonds are a great option. This simple 1.6-millimeter band is pave-set with tiny colorless cubic zirconia gems for a gorgeous, glittering effect. Available in sizes four through nine, it retails for around $35. Whether you choose a cubic zirconia for your wedding or simulated diamonds for a cocktail ring, you'll love the way these pretty gems sparkle without costing a fortune.